Now two months after Hurricane Maria ravaged Puerto Rico, citizens are still having a tough time doing almost anything, and half of the island is still without power. The effect of the storm has caused at least two student organizations to take action. Senior Becca Sauter is one student involved in a campus-wide joint fundraiser aimed at aiding the victims of the hurricane. Sauter is the public relations coordinator for the University Honors Student Association, and she feels getting help to those on the island is a top priority. In partnership with the global humanitarian organization Heart to Heart International, UHSA and Student Association are putting together a plan to raise money. “We’re asking our honors students, we’re asking SA students, we’re asking other student organizations on campus, and just other students on campus, to adopt an envelope,” said Sauter. Adopting an envelope is their way of collecting funds from various people on campus here at UMD, or out in the local community. They’re encouraging students to form teams and collect money that way, as well. 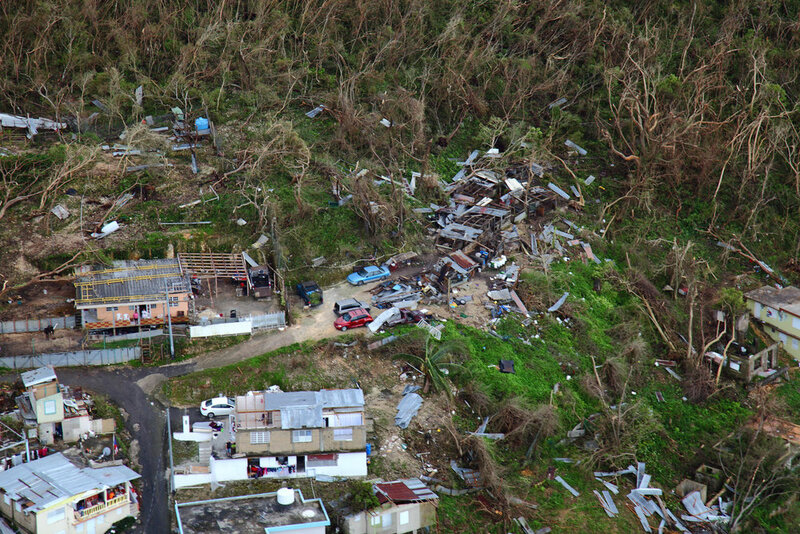 Homes lay in ruin as seen from a U.S. Customs and Border Protection, Air and Marine Operations, Black Hawk during a flyover of Puerto Rico after Hurricane Maria September 23, 2017. Photo by Kris Grogan. Sauter remains hopeful that Puerto Rico will get the help it desperately needs due to the fact that this type of fundraiser has proved itself in the past. A Coast Guard member deployed to Borinquen, Puerto Rico in support of Hurricane Maria relief efforts delivers a case of water to a resident of Moca, Puerto Rico, Oct. 9, 2017. Photo by David Micallef. Sauter herself has a deep personal connection to those who are struggling without power and little medical attention. For more information on how to adopt an envelope, stop by the University Honors lounge (21 EduE) or donate directly online.